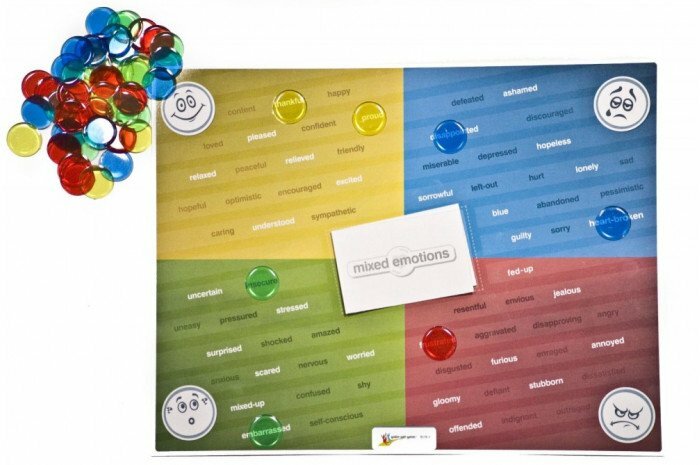 This best-selling activity includes a newly designed board, 60 chips, and 90 situation cards. 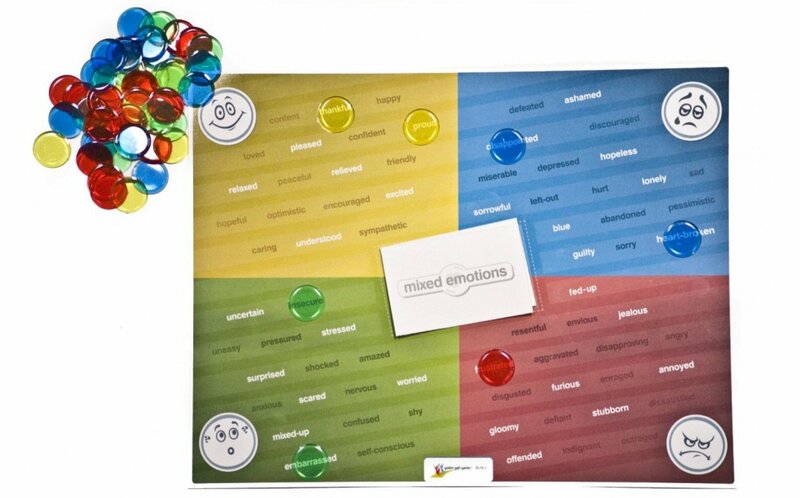 The board and chips can be used for a variety of CBT activities in individual or group therapy and is frequently used in school counseling as well. Each card presents a person confronting a situation that might evoke "mixed emotions." The persons presented include children, teens, and adults. This mixture allows players to put themselves in the place of other people, which helps players understand multiple view-points and aids in the development of empathy. Sample cards: (Child card): Max just got back from a visit with his father and stepmother. His mother asks him lots of questions about his father's house. (Teen card): Brandon's parents say the clothes that he likes cost too much. So he decides to earn the money by mowing lawns. (Adult card): Eva has the day off and she invites her son to go to a movie. But he says he would rather play on the computer. This game has been very helpful. It is not cheesy and kids really relate to the situations. This new improved version is terrific! More substantial and should last a long time. Great for using with elementary students. I used this with middle school students in 6th thru 8th grade. They all will actively engage in playing it, especially when it's an alternative to just sitting and talking, even the 8th graders. I also put little figures on it from that popular feelings movie on each of the 4 corners and that really makes it more fun for them. I use the feelings check-in actibivity regularly with with adolescents and adult clients. Its brilliant for building self-awareness, emotional vocabulary and empathy.